You'll begin this chapter locked up in the Blackbird without any equipment, items, or money. Unless if you have Ayla in your party you won't be able to attack at all. You'll need to recover the three sets of equipment, the items, and the money before you move on. Check the door and head up the ladder to look at the ship, and one of your party members will inform you of another level you can use to get into the grating system. If you have Ayla in your party you can also ambush the guard outside the door, otherwise just head up. You can look through the floor by pressing at the light patches on the grate. Head to the northeast and a little south then west to find a ladder which leads to a room guarded by a single sleeping guard. You'll pick up the 1st Char. Equipment for the lead character in your party, and finally be able to fight. Head all the way to the south to get a peak at Dalton renovating the Epoch. I'd recommend starting out with the ladder in the southwestern corner, and head in the door to pick up the 3rd Char. Equipment for the third character in your party after a small fight. The right door just contains a pack of enemies so you can ignore it if you want. Also be careful of the security robots and don't move when they come near. Keep in mind also you can flip the direction of the conveyor belts. Head through the left door after going over the conveyor belt to pick up your Money after another fight, and the right door just leads to your prison cell. First character's equipment: Northwestern ladder in grate area, only accessible from grates, no fight required. Second character's equipment: Door directly north of your prison cell. Third character's equipment: Left door all the way south of the ship. Items: First left door in the north area of the ship. The exit from the ship is in the same room the items were in. The one other thing you might want to do is go up a ladder and head to the northeast portion of the grates to pick up a Magic Tab. After that, go back to the room the items were in, and get your footing while walking across the wing of the blackbird. The turrets are good for 1500 experience points and 100 tech points, so fight them all if you can; they "Self-Destruct" like the Rubbles run away. 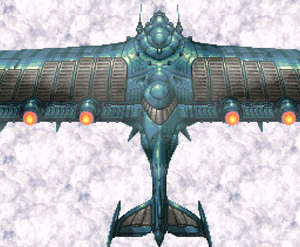 When you want to progress, head to the bottom left corner of the wing to fight the Golem Overlord. This boss does not attack. The Golem Boss you fight is a joke boss fight, but he has a ton of HP. He'll count down from 5 twice, only to do nothing. Then he'll start quivering and talking about how he hates heights. He'll run away if you let him, so go ahead and try to finish him off with your best double techs and single techs, he gives you a fair amount of experience and cash for the trouble. You'll jump straight from the Golem Boss into a fight with Dalton, which is similarly easy. Just use a few powerful techs, and after he casts Iron Orb a few times he'll be history. 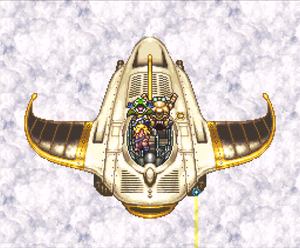 If you have Marle, Lucca and Ayla on the team, simply use Iceberg Toss with Marle and Ayla and then use Lucca's Megaton Bomb and he will die. The epoch will be able to fly, and will blow up the Blackbird after being prompted to press and then . Your party will insist on finding Crono before you go anywhere, so explore around (the Nu in the middle hut is selling new equipment) and head to north cape. Your party will run into Magus, and you'll witness another flashback explaining the remainder of the events you've seen so far, showing how the three gurus, Gaspar, Melchior, and Belthasar, ended up in their respective time periods, as well as Janus/Magus himself. And at this point, you'll have the option to make the first choice which will really influence the course of the game, whether or not to fight with Magus or have him join your party. If you fight with Magus, if Frog is in your party he'll challenge him alone, otherwise you can take him on as a trio. Frog will turn into a human in the ending if you kill Magus, but Magus will stay with your party and be in the ending if you spare him. For a brief description of how either option affects the two endings you can get at this point, see: The Reunion Ending and The Main Ending. It is highly recommend that you keep Magus in your party, particularly if this is your first time through the game, since he knows a lot of magic which will help a lot. And really, why kill a guy when he just went through all that himself? Whatever your choice is, Magus will inform you that Gaspar the Guru of Time might be able to help you and you'll get Magus's amulet, a gift from Schala if you remember. Since you've been through the boss fight previously, you should know the drill. Match his magic barriers and keep healing like before. But if you're using Frog alone, balance your attacks and techs as much as you can. It's best to do it in New Game Plus to unlock all the endings. Do it only if your team is able to take on the final boss without too much trouble. This page was last edited on 24 February 2014, at 04:59. This page has been accessed 124,798 times.